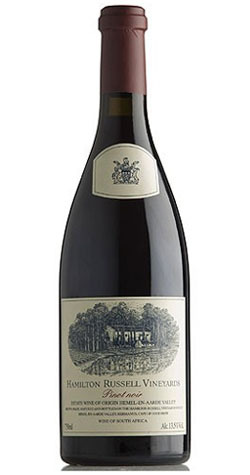 This Pinot noir is not overtly fruity, soft and “sweet” and it generally shows hints of that alluring savoury “primal” character along with a dark, spicy, complex primary fruit perfume. 2017 was back to our usual timing after a particularly early 2015 and 2016. As for 2015 and 2016 however, the duration of the harvest was short, with all grapes coming in prior to the end of February – having begun the harvest in the first week of February. Based on average maximum temperatures for the crucial months of Dec, Jan, Feb, March, 2017 was a warm harvest – 0.53 centigrade above our long-term average of 25 centigrade. December was warmer, January cooler and February warmer than average. Rainfall for these crucial months was only 10mm below our long-term average, so conditions could not be described as particularly dry. The rain which fell was in more regular very small amounts however, raising humidity and creating botrytis pressure. Our organic use of “good” Trichoderma funguses to attack botrytis was fortunately highly effective and we experienced no detrimental effect on what turned out to be exceptional grape quality. Altogether 2017 was an excellent vintage for us, with pure, fine, particularly classic, elegant wines with marked minerality. Founder, Tim Hamilton Russell purchased the undeveloped 170-hectare property in 1975, after an exhaustive search for the most southerly site on which to make South Africa’s top cool climate wines from a selection of noble varieties. His son Anthony, who took over in 1991, narrowed the range to Pinot noir and Chardonnay only and registered Hamilton Russell Vineyards as an Estate, committing to work only with grapes from their terroir. Extensive soil research initiated in 1994 identified 52 hectares of stony, clay-rich, shale-derived soil as optimal for the individual, origin expressive style they aim for and all plantings have now been limited to this soil type.